CoSN (the Consortium for School Networking) today released the findings from its 2018 K-12 IT Leadership Survey Report. The results show that school leaders place a high priority on cyber security and broadband / network capacity. Also, continuing the trend of previous years, budget constraints remain a top challenge for school technology leaders. Cyber security and broadband / network capacity are the top priorities for IT leaders. When asked to rate the importance of privacy and security of student data, 68 percent of IT leaders indicated that it was more important than the prior year. For the fourth straight year, budget constraints are the top challenge facing school technology leaders, followed by the unavailability of relevant training and professional development as well as the existence of silos in school districts. The transition from print to digital materials in school districts is taking longer than projected three years ago. In particular, three times as many districts (54 percent) are primarily print-based than were projected (16 percent) three years ago. 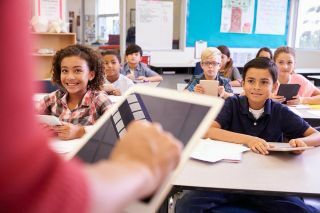 Twice as many districts that are seeking to create a 1:1 environment are providing the device to students versus using Bring-Your-Own-Device strategies.